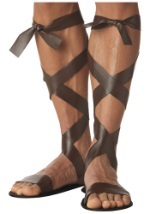 Put the finishing touch on your ancient goddess costume with these Greek costume shoes! These dazzling sandals have two golden, braided straps that run horizontally across your foot and three that wrap around your ankle and calf. The ankle and calf straps have adjustable buckle clasps for a perfect fit. A wide braided strap runs from your toes up your calf and the heel has a solid, gold colored piece for comfortable wear. The shoes are made from entirely synthetic materials and the bottoms have an anti-skid tread. 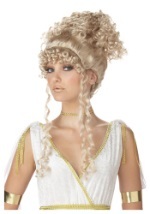 Perfect for any Greek goddess or Cleopatra costume!